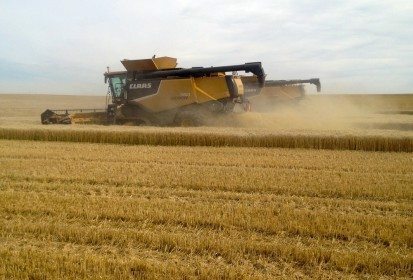 Achieving a 137 bushel per acre yield on CPS wheat in a relatively dry year is certainly noteworthy, but Fred Wood, an Alberta consulting agronomist says the real story is about the benefits of having a complete agronomy program. Varieties are important to some extent, says Wood who owns Meridian Ag Consulting, but the real key is a whole package of inputs and management, which makes it reasonable to push for higher yields. Wood was commenting on yields of AAC Penhold CPS wheat grown on Thompson Family Farms near Spruceview in west central Alberta. Working with Wood, the Thompsons had targeted a 130 bushel yield. The crop averaged 137. Similarly with hard red spring wheat they had targeted 90 bushels and yields averaged 94 bu./ac. Feed barley with 17 per cent hail damage had an actual yield of 139 — without the hail it would have been about 150 bu./ac. Malt barley came in at 131 bu./ac. “Achieving these higher yields isn’t necessarily about variety, but involves a whole package of good agronomic practices,” says Wood. “It isn’t really any one thing that makes the difference.” He says obviously weather is factor, but even in a relatively dry year like 2015, these higher than average yields are achievable with proper inputs and management. This high-yielding CPS wheat is a good example of the program that Wood and Thompson Farms developed. The year started out seeding the variety into a good seed bed with “excellent moisture.” Targeting 130 bushel yield, Thompsons applied 90 pounds of nitrogen as spring banded anhydrous ammonia just ahead of seeding. Seeding into pea stubble, they also applied a fertilizer blend of 20-20-0-10 in the seed row. The crop had good even emergence and later in the season was treated with an in-crop weed control product. One important new tool also applied was Manipulator plant growth regulator (PGR) at the five- to six-leaf stage. “This was the first year they had used Manipulator, but I feel it is important tool farmers have to consider as they target higher yields,” says Wood. “It would be foolish to grow some of these wheats with this high fertility and not use it. With the CPS for example you’re pushing it 20 bushels past its standability limit, so you need to use something.” Last year the Thompsons had applied Etherl, a long-established PGR developed by Bayer CropScience. It was effective for reducing crop height and standability in hard red spring wheat — it was as much as four to six inches shorter — but it has to be applied with very specific timing. Wood says there is a one or two day, maybe three-day window for effective use of Ethrel. Manipulator has a much wider window of safe application, although it’s optimum performance is at Growth Stage 31. Although the crop started with good moisture, overall it was a hot, dryer growing season, says Wood. This CPS was seeded on heavier soil with high organic matter content that helped to hold moisture for the crop. There were a couple timely half inch showers, but overall he figures the crop could have used at least another 1.5 inches of rain. The crop held with fairly even maturity making it possible to straight combine in September. Wood says the PGR didn’t have a dramatic affect on reducing the height of the CPS wheat but it did help to strengthen the stem and improve standability. He says PGR treated CPS wheat was about one inch shorter, but the product still worked. The PGR had a more visible affect on the height of the hard red spring wheat.